It’s hard to determine whether anything is or isn’t right for you before you’ve given it a try. But this is what many people entering the truck driving industry have to do, and the stakes for them are much higher (18 days of training plus the time getting started). 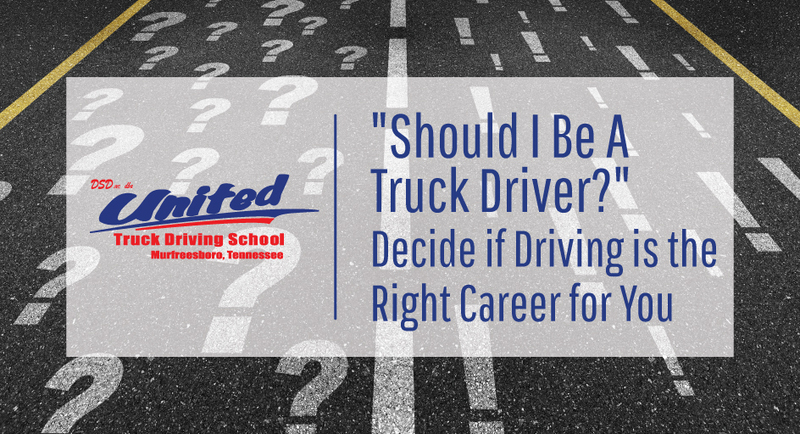 Considering the amount of time that has to go into preparing for one’s first truck driving job and then giving it a go on the road, deciding to become a truck driver is different than trying to get a job in any other field. When you’re working as a truck driver, you’re not just giving something new a try. Truck driving is a job as well as a lifestyle. How do you know if the truck driving lifestyle will be right? Many will throw around phrases such as “just try it out” or “ride with a truck driver and see” but both of those things are unrealistic. As stated above, you have to make a commitment to getting your commercial driver’s license. And it’s rare that those considering truck driving have a friend in the industry they could tag along with for a week or two. So, what should you do? Since you probably won’t have an opportunity for experiential learning before going out on the road by yourself, research is key and should be done often in order to learn about the industry. Read truck driving publications and magazines such as Overdrive Magazine, Landline Magazine, and The Trucker. These publications will inform you about new industry standards, technologies used, and even current events involving trucking from across the globe. Even more critical to read, though, may be a blog written by a truck driver about their experiences on the road. Check out this list of blogs recommended for drivers who are new to the industry. From reading blogs, you’ll learn more about the challenges and rewards that working as a truck driver can present. While you may not be able to ride along with a professional truck driver, you may be able to speak with one for a little while. Just like you would network for other jobs, set up a time to speak with a professional over coffee. Unsure of how to get in touch with someone in the field? Contact your local truck driving school to see if they could help you out in any way. If you’ve done some of the above and have made the decision to enroll, there’s good news! Earning your CDL takes as little as 18 days with United Truck Driving School in Murfreesboro, TN. Becoming a truck driver requires a lot of consideration, but once you begin the process, you can be out on the road in no time, enjoying the lifestyle that truck driving has to offer.